The Islanders, the top-ranked team in Class 3A, held off the No. 2-2A Polars behind Tyrell Terry and Kameron Givens, who combined for 43 points. When the season nears the final stretch, if nothing else, DeLaSalle can say it’s well-prepared. Maybe more so than any other team in the state. Tuesday, the Islanders, ranked No. 1 in Class 3A by Minnesota Basketball News, returned home to host No. 2-2A Minneapolis North. Playing without their leading scorer, Jamison Battle (28.8 points per game), the Islanders absorbed a second-half charge from the Polars and finished out a 66-57 win to reignite a dormant rivalry — and close what might have been the toughest four-game stretch any team in Minnesota will have faced this season. DeLaSalle’s last three games were in the Hoop City Classic in South Dakota over winter break, where the Islanders lost 78-68 to national powerhouse Findlay Prep (Nev.), beat nationally-ranked (No. 16) Mountain Brook (Ala.) 62-61 and lost 71-65 to reigning South Dakota Class AA state champion Yankton. Battle, who rolled his ankle early in the first matchup, hasn’t played since. 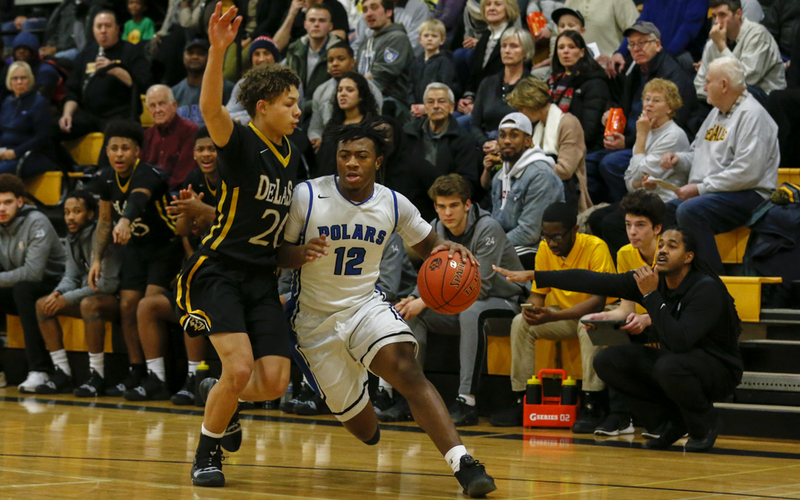 Against an athletic and balanced Minneapolis North team, DeLaSalle led 25-18 at halftime, but fell behind by as much as four early in the second half. A big effort by senior Tyrell Terry, who had 18 second-half points to finish with 23, helped the Islanders pull back ahead, as did 20 points from Kameron Givens. 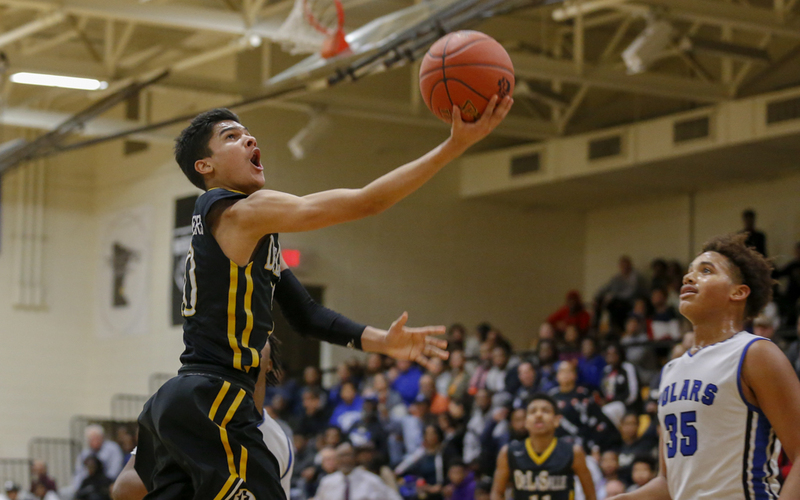 DeLaSalle (6-3) also missed Terry for a couple games earlier in the season due to injury, and the Stanford-bound senior came into Tuesday averaging 28 points per game. Terry’s big-time scoring is a new role for the 6-3 guard, who was more of a facilitator last year and on his AAU team this past summer. The Islanders have rarely been at full strength, but still own wins over No. 5-4A Eden Prairie (76-66 on Dec. 1) and No. 8-4A Wayzata (70-49 on Dec. 8), in addition to this latest victory over the Polars (6-3, 2-0). Givens’ presence was especially important against the Polars, as he finished around the rim and made key plays in the second half. Jalen Travis added 10 points and eight rebounds as the lone big man with Battle out. The silver lining to players missing time with injury has been the opportunity for others to step up in meaningful ways. Between the level of competition and the need for players to step up, few teams are able to say they’ve faced the kind of adversity and pressure the Islanders have. And the cherry on top to finish this brutal four-game stretch is a win in the first game between DeLaSalle and Minneapolis North since Feb. 4, 2011, a 63-61 Islanders’ win. Bledsoe, a DeLaSalle alum, grew up in North Minneapolis. It had been a while since two of the top boys' basketball programs in the state met. 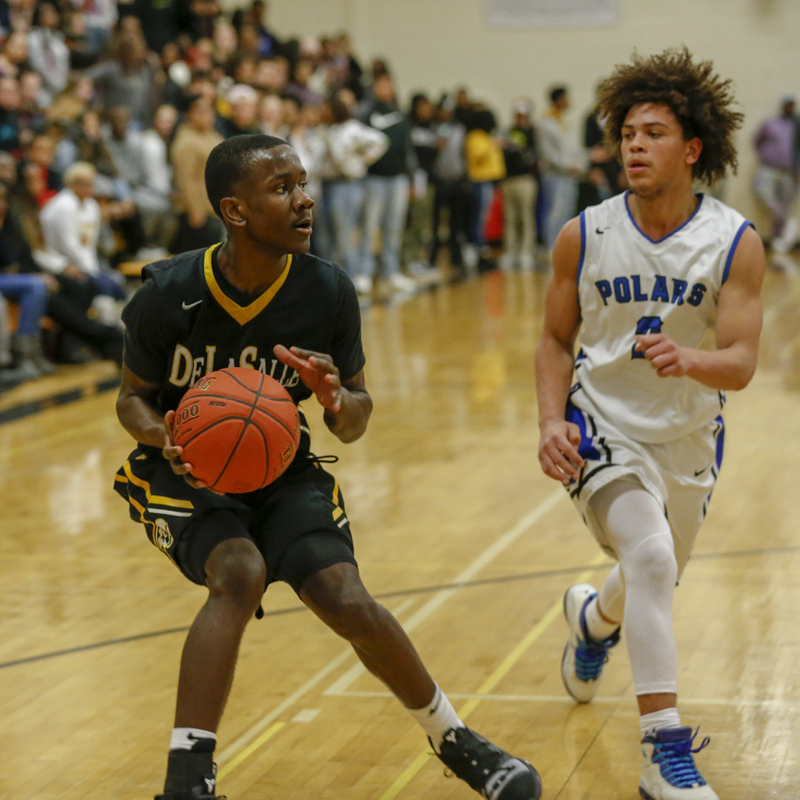 This time, it was DeLaSalle that won on its home court in a 66-57 win over intracity foe Minneapolis North on Tuesday night. A choppy first half, thanks to fouls and turnovers, led to DeLaSalle (6-3, 0-0) leading 25-18 at halftime. Minneapolis North, ranked No. 2 in Class 2A by Minnesota Basketball News, briefly led early in the second half, before the game became a back-and-forth affair. Tyrell Terry had a big game for the No. 1-3A Islanders, finishing with 23 points. Teammate Kameron Givens added 20 points while Jalen Travis had 10 points and eight rebounds. Eli Campbell led the Polars (6-3, 2-0) with 17 points, while Willie Nelson had 12 points and Nasir El-Amin added 10. The teams last played each other on Feb. 4, 2011, which resulted in a two-point Islanders’ win at Minneapolis North.